Tucked away at Nusa Dua Beach, the charming ambiance easily can be found at Samabe Bali Suites and Villas. It showcases a romantic decoration with thousand lit candles and to make it more dramatic, millions of flowers are provide to enliven your night. Offer 2 choices of venue, the famous The Power of Love are now available with rustic or elegant concept. 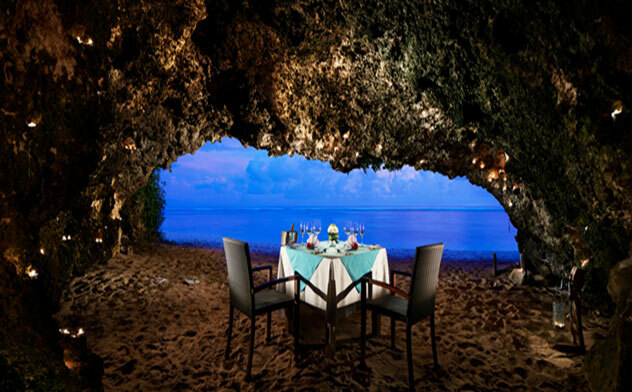 Where the guest can pick one of their favorite, the rustic one will be at the beach cave while if the guest choosing the elegant, they would get an absolute luxury ambiance inside the chapel. Whether creating a full evening of fine dining or slipping away for a few hours of simple relaxation with friends, the atmosphere of this exceptional destination allow guests to design their own escape. With a passion for good food, our culinary team is the creative behind the delightful dishes. The private waiter or waiter will drag the seats to allow the couples to sit on chairs with flowers round in front of them. The table is covered luxury colors with red rose petals spread on it. Then, they will see the best thing about the dinner, which is the marriage of turquoise ocean view, and dark blue sky that they can enjoy when they are sitting on their chairs. The dinner is at its best at 18.00 to 22.30 hours. 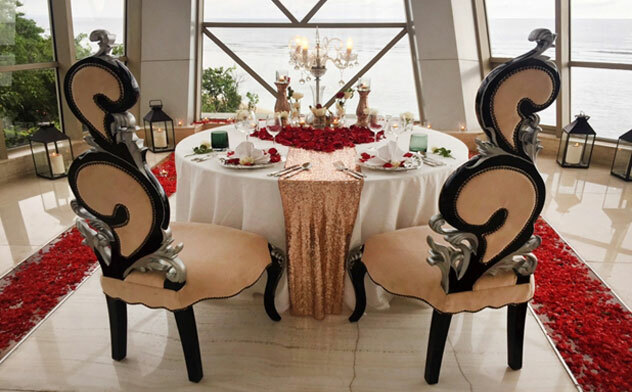 The 5-courses set menu attempts to bring the sensuous delight of the sea to the dining table. All dishes are freshly cooked at the beach while the couple is enjoying the breeze, such as succulent prawn, lobster, mixed kebab chicken shish or Black Angus tenderloin beef. To end the moment sweetly, the Chef presents Sticky Thai rice pudding with fresh mango. “We commit to deliver impressive gastronomy experience as well as an unforgettable romantic moment at Samabe that marks our place as one of the meaningful places in our guest’s life” Said Ralf Luthe, General Manager Samabe Bali Suites & Villas.